Vinyl is back! On Saturday 24 March 24th, DJ Singlelicious will show her DJ skills at The Grass Company Piusstraat. Last month Eva was spinning her records at The Grass Company Piusstraat during Eva’s Roaring 60’s. On Saturday 24th of March 2018 we again have a very talented lady who is going to show us what she’s got. Hi Amy, how long have you been a DJ? I’ve been a DJ for 3.5 years now. The part I like the most is that you can make people go nuts just by playing music. But basically my DJ-career is a hobby gone mad.” Amy, just like Eva, has a thing for vinyl. Something that we are very happy about since our shop has an extensive sound-system suitable for playing vinyl. Amy also visits the coffeeshop sometimes. As cannabis professionals we are very curious about her favorite joint. Without overthinking she almost immediately said ‘a ketama one’, which is at least as much a classic as vinyl, right? 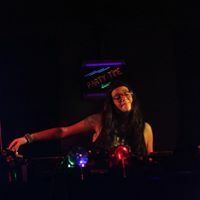 Want to see DJ Singlelicious live with her vinyl records? Come to The Grass Company Piusstraat on Saturday 24th of March. PS, don’t forget to ‘attend’ yourself on the Facebook Facebook event😎.